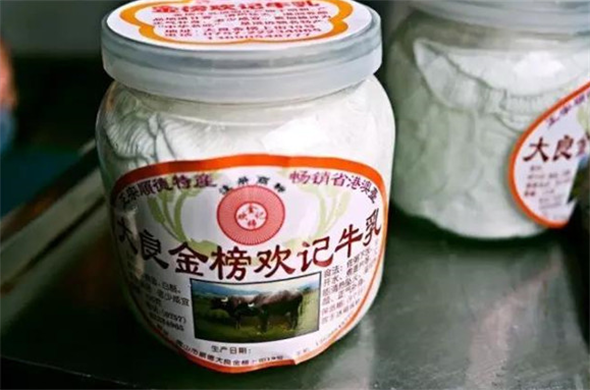 A slice of milk curd that is as thin as a cicada’s wing may puzzle people from other places, but it’s an indispensable gourmet for Shunde people and it’s a gem of wisdom which people feel proud of. A small pot of milk and a pot of vinegar are heated in turn on the coal stove. Boil the fresh milk that was received in the early morning with the marmite to 40-50°C. The temperature of the milk and vinegar determines the success of the milk curd. A too high temperature may be difficult for the milk to solidify. The ready-made milk curd will be put in the glass bottles and the milk that is easy to go bad could be preserved in this way. Putting it in the water to drink can help you to clear heat; And it could be put into the rice, making it taste special.